Your home can start to look shabby and worn down if you don’t pay close attention. After years of living in one place, the furniture can get ragged, the appliances can deteriorate and the interior design can look dated. The only solution is to give your home a makeover so it feels fresh and beautiful again. Follow these four steps to elevate your Kitchener home, and your space will look brand new. Start your home re-design by replacing your old, depreciated windows with high-quality ones. Each style of window will bring a different benefit to the property: bay and bow windows will expand your interior space; awning windows add dimension to the exterior space; and architectural windows can be customized to be whatever beautiful shape you desire. Do your research and find a professional window manufacturer in Kitchener to help with the selection and installation. After installing your brand-new windows, you can’t forget to dress them. Be careful when purchasing your curtains, because the fabric might not hang properly and could easily fade because of sunlight. Recommended fabrics are linen, velvet silk and faux silk — faux silk is the most reliable bet, because it has the same look as silk but lasts longer in exposed sunlight. Put on a fresh coat of paint in a vivid colour to make your walls pop. If you don’t want to commit to painting your entire house, choose the rooms that don’t have bright furniture or drapes. For instance, paint your bathroom a beautiful hue like teal or Windsor pink to offset all the white porcelain. Or you could add dramatic flair to a room by painting only one of the walls or painting the door a bold hue like plum. You can use this year’s colour trends as inspiration for your home decor, or ignore them and become next year’s trendsetter. Hanging mirrors in every room is a brilliant way to elevate the design of your home. Mirrors are an interior designer’s special trick to make a room look bigger. For instance, a narrow hallway or corridor will feel more spacious with a full-length mirror on the wall. Try to find mirrors of multiple sizes with different types of frames to add texture and variety to your rooms. Bad lighting can make your home look dreary, so brighten up your space. Install dimmers for rooms that require mood-lighting, like the dining room or the bedroom. Choose overhead lights for spaces that need more visibility than atmosphere, like the kitchen or bathroom. These changes will do more than make your home look better, they will make it feel better, too. 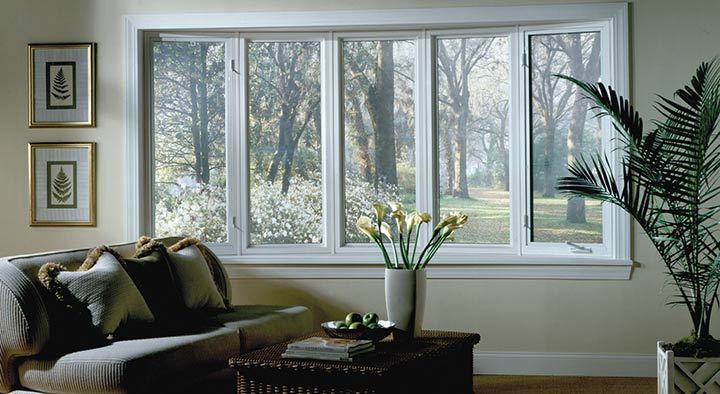 Installing brand new windows will bring lots of natural light. Painting with bold colours will refresh your rooms, while adding mirrors will make them look bigger. Upgrading your lights will change the atmosphere of your space from somber to sweet. If you follow these simple suggestions, you will improve the look and the feel of your Kitchener home.